The sequel to Made In Sheffield called 'The Beat Is The Law - Fanfare For The Common People' is available to buy from the SHOP. Made In Sheffield - a film by eve wood. a sheffield vision ltd/slackjaw films ltd production. 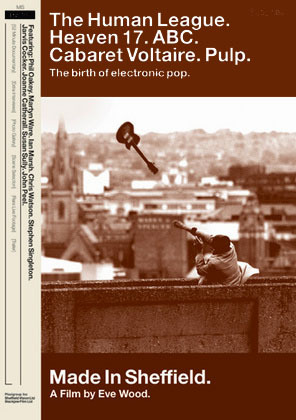 The best post-punk music in Europe was electronic music & for five years the best electronic music came from Sheffield. Made in Sheffield documents the evolution of the Human League, Cabaret Voltaire, Heaven 17 & ABC, who emerged from Sheffield's music scene in the late 70's. Their dream was to destroy rock music. The result was the creation of some of the most influential sounds in pop music. Rare archive footage, soundtrack & exclusive interviews with the famous, almost famous & not famous at all pull you directly into the Sheffield music scene complete with fanzines, nightclubs, weird bands, DIY record labels & all the ambition & creativity that made that time so special. Loaded with endearing moments & humour, it captures the essence of the seldom portrayed aftermath of Punk & the spirit of the early 80's British New Wave movement. John Peel and many other faces and bands that made this scene unique.